The opal is the traditional October birthstone while the pink tourmaline is the alternative stone for October. Opals are gemstones valued for their flash of rainbow colors. The name opal is derived from the Latin word, Upala, meaning "precious stone." 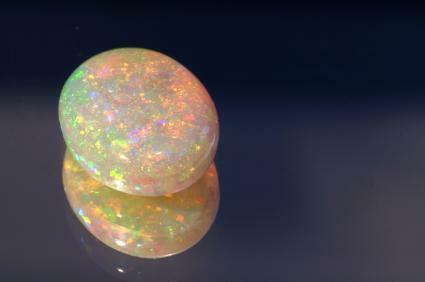 Most opal is over 50 million years old and was formed as silica. The stone when moved and exposed to light omits flashes of colors from within the stone. Colors of blue, green, aqua and sometimes yellow and red can be seen in the stone. Most opal we see today is mined in Australia. The most rare and expensive of opals is the black opal. It has a dark base color and flashes of red and yellow within it. The more common opal is the light opal which is either crystal or milky in color. The stone contains flashes of rainbow colors and is widely available. Another opal variation is natural opal. This variation is not treated and is often cut into more designs to enhance the natural beauty of the stone itself. The Romans thought the opal was the symbol of hope and purity, believing that those wearing opal would be safe from disease. The Arabs believed that opals fell from heaven in lightning flashes while the Greeks thought opals gave them foresight and prophecy abilities. The Aborigines believed opals had spiritual value and that they represented something left behind by their ancestors as a sign of their presence. The tourmaline is a gemstone exhibiting a broad spectrum of colors. The name tourmaline is from the Singhalese word tormall meaning "mixed precious stones." Tourmaline can be found in a wide array of colors. Pink being the stone for October. The pink tourmaline gets its color from manganese along with other metals present in the crystal structure. Tourmalines are known as the peace stone and are believed to make the wearer calm. They are also believed to reduce fever. Wearing the gemstone affiliated with your birth month is believed to bring you health and good fortune. Birthstone jewelry makes a great gift for someone special since it is personal and lets the person enjoy something significant to them and their particular birth month.